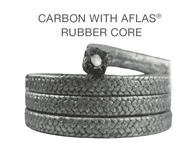 Carbon Fiber c/w Aflas® resilient elastomer core. Excellent choice for side, bottom and top entry agitators/mixers. High purity carbon yarn c/w Aflas elastomeric resilient core.